Click here for audio of Episode 1361. Today, we ride the world's largest land vehicle. The University of Houston's College of Engineering presents this series about the machines that make our civilization run, and the people whose ingenuity created them. If you ever toured the Kennedy Space Center, you rode a long broad road from the NASA assembly building (where the shuttle is put together) out to the launch pad (where the shuttle lifts off). Actually, that's only one half of a very special road. Parallel to it, and a stone's throw away, is an identical road. The surface of both is loose stone, with a far deeper substrate than you'd expect. Actually, each of those parallel roads carries one side of the world's largest land transport vehicle. It's a machine called a Crawler Transporter, originally created for NASA to carry an assembled Saturn rocket on its five-mile journey from the assembly building to the launch pad. And the Saturn is even larger than the Space Shuttle with its booster rockets. The Crawler makes more sense as an engineering accomplishment when we digest the magnitude of the task. It was designed to carry a twelve-million-pound rocket and launching derrick and to keep them within ten minutes of an arc from pure vertical while it negotiates grades of as much as five degrees. This mode of transport was selected in preference both to a special barge-and-canal system and to a rail system. What finally emerged was something out of science fiction. It's 131 feet long and 114 feet wide. It weighs six million pounds. The structure rides on four double tracks, each pair the size of a Greyhound bus. Inside its huge deck are diesel engines with a total output of almost eight thousand horsepower. They drive generators that supply electric motors for the tracks, for the delicate leveling mechanism, for the cooling systems, and for other internal functions. The five-mile journey to the launch pad takes a highly trained crew of eleven people: a driver, four observers at different locations who advise the driver on steering, and six technicians. The Crawler moves two miles an hour unloaded and one mile an hour with the rocket in place. Its fuel economy is about 1/150th of a mile per gallon. And who do you suppose built this high-tech behemoth? Actually, two were built originally, and they were not products of the aerospace industry. The Crawlers were made for NASA by the Marion Power Shovel Company in Ohio, a company with experience in heavy earth-moving equipment. The crawlers cost fourteen million dollars each in 1967, the year they went into service. 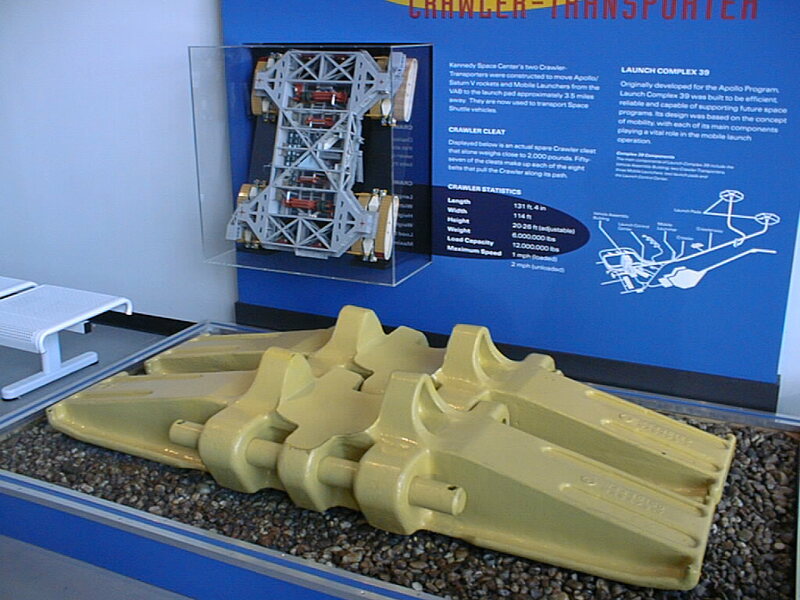 The Crawler Transporter is the twentieth-century spawn of engineers like Brunel, Eiffel, and Roebling. Now we leave their heroic 19th-century renderings in iron, and we take up a technology of speed, space, and light. The rocket reaches for the heavens while we and the Crawler stay gravity-bound. It calls up all the unbearable contrast of the rocket itself, as it becomes a golden speck in space. The American Society of Mechanical Engineers (ASME) named NASA's original Crawler Transporters as a National Historic Mechanical Engineering Landmark on Feb. 3, 1977, at the John F. Kennedy Space Center. Information for this episode was originally obtained from the dedicatory brochure for that ceremony and later expanded by a great deal of NASA material. This is a greatly revised version of Episode 25.